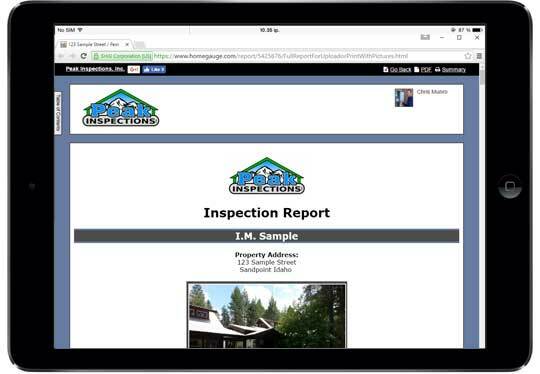 Sample Report | Peak Inspections, Inc. Many inspectors use a checklist to record information about your home. These checklists are a generic form that can have handwritten comments added but they can be difficult to interpret. We provide you with a computerized custom narrative report that includes information pertaining only to your home. Each system inspected is described by its components and then comments are written in plain english so you don’t have to be a contractor to understand the report. Color photos are included to help you understand the home’s condition. You can choose to receive your report through this website for quick delivery, or as a spiral bound hard copy.